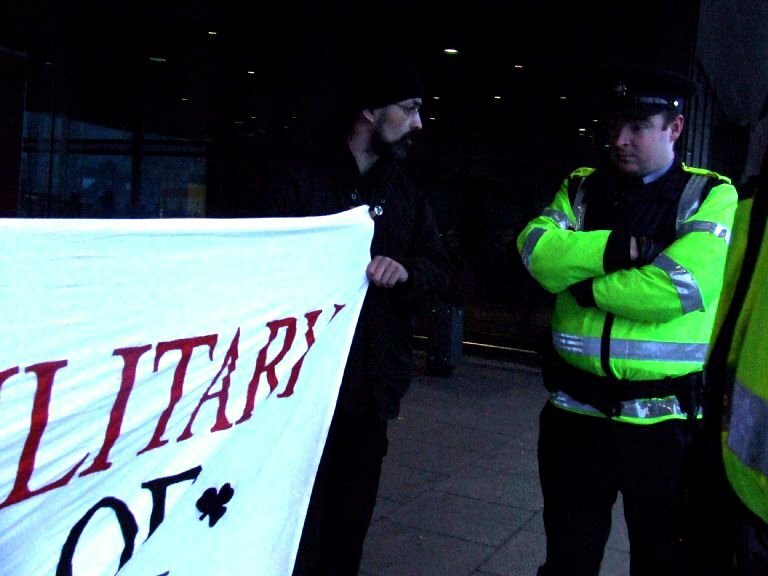 A short report describing the harassment experienced by protestors while displaying an anti-war banner at Shannon airport. The report highlights the fact that the Gardaí are either unaware of the law or do not practice it. This contrasts strongly with the claims by the government that gardaí are upholding civil and human rights at Shannon while at the same time facilitating the transport of US military supplies and CIA planes that are used for the transportation of torture victims. Paul O’Toole, Elaine O’Sullivan and yours truly infiltrated Shannon Airport yesterday to unveil a banner that read “US Military Out Of Shannon,” outside the entrance to the main terminal building. I use the term “infiltrated,” lightly. In truth, we’d overshot the Peace Camp and ended up on the approach to the security checkpoint in the airport. We were behind two other cars that were stopped at the checkpoint and we were watching a group of Gardaí who were unlawfully preventing a group of activists, who were on foot, from entering the airport. After a quick chat with the occupants of the two cars in front of us they were waved on and it was our turn. The Gardaí gave a quick glance into our vehicle and without a single question waved us on too. It was like a scene out of Star Wars, where the Stormtrooper allows Luke Skwalker and Obiwan into the city after Obiwan uses the ‘Force’ and tells the Stormtrooper that there’s nothing to see and that there’s no reason to stop them. Paul parked the car in the short-term car park. We took out one of the banners that we’d brought and made our way over to the entrance of the terminal. Paul and I waited beside two Gardaí as Elaine went into the terminal for a trip to the ladies. When Elaine came out we made our way over to the other side of the entrance and unfurled the banner. Elaine and I held the banner and Paul took pictures. 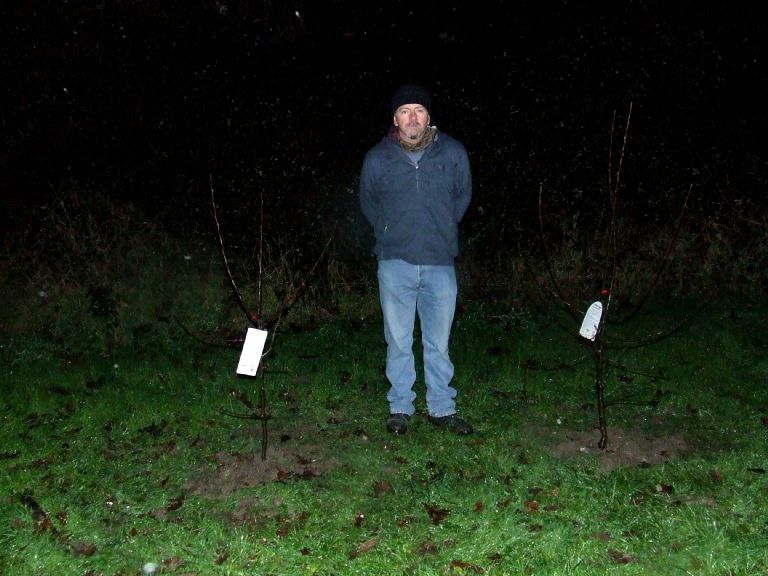 We were waiting for about ten minutes and freezing before we came to the attention of the Gardaí. The two Gardaí that Paul and I had stood beside initially, came over to us in a very business-like manner and after the initial greetings they got down to business. We were informed that we were engaged in an unlawful activity and that we’d have to leave. The Garda speaking at this point, after being questioned said he was enforcing the Air Navigation and Transport Act – Section 8. I didn’t correct this Garda with regard to this – section 8 is the wrong section. Section 33 is the section that he should have been aware as being the relevant section. A Garda has no power to enforce a law he is unaware of. Understanding that it was section 33 that should have been used, I informed the Garda that I was not in violation of the Airport Navigation and Transport Act and that we were at the airport for a lawful purpose. I told him that were we there to protest and asked him if he considered protest to be unlawful. He had no answer for this and told me that he was acting under the instructions of the airport police (sounds similar to the actions of the Gardaí in Rossport). I then told the Garda that he was bound by his oath where he promised to uphold the Constitution and my rights. He answered that he was only following orders. To which I answered that the order that he was following was an unlawful one and that I would not be paying any attention to it. After he got over his amazement that I was disobeying his order he told me that I would have to follow his order or that there would be action taken. 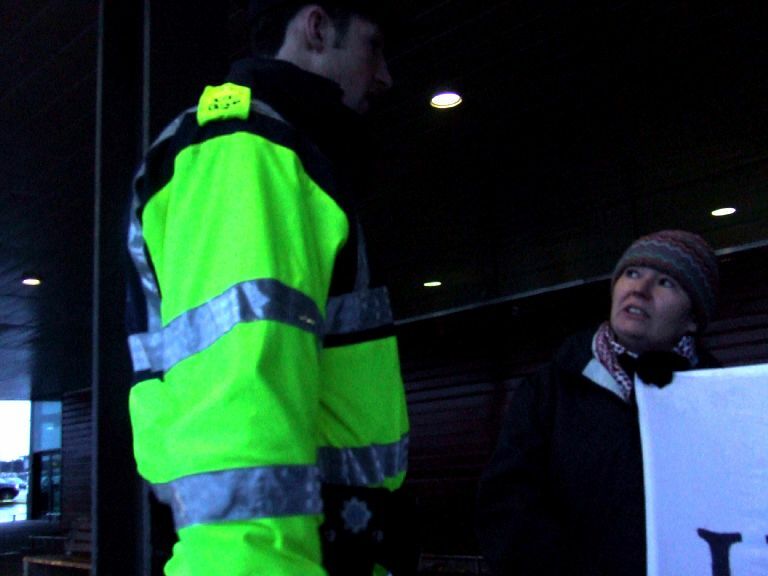 At this point the (big) Garda that had been interacting with Paul and Elaine came over to me and demanded my name and address under the Public Order Act. I informed this Garda that despite the fact that he had no business using this act to demand my name and address that I would comply. I decided not to get into a semantics-based argument on this because Section 33 of the Airport Navigation and Transport Act allows for an ’Authorised’ person to demand my name and address without supplying a reason for this demand. However, the Garda had demanded my name and address using the Public Order Act, and he had not cautioned me before doing this. I decided to explore this with him before supplying my details. I asked him what reasonable suspicion fuelled his belief that we were about to provoke a breach of the peace. He had no answer for this and just parroted his demand that I supply my name and address under the Public Order Act. I asked him if he felt that I was either a threat to security or if I were likely to provoke a breach of the peace in his opinion. He could not or would not answer this either. These were grounds to ignore both him and his order, but I gave my name and address at this point for reasons that I’ve already gone into. At this point Elaine was giving a running commentary to Tim Hourigan via a phone. Tim was stuck outside the Airport with other activists. Paul continued to snap pictures and to ask the Gardaí questions regarding their want to quell legitimate protest and at the same time enable and facilitate genocide. The Gardaí had no answers for Paul either. At one point in her conversation with Tim and before I’d given my name and address, Elaine told Tim that I might be arrested. To this the (big) Garda answered that nobody had said anything about arrest. A squad car and an Airport Police van pulled up at this point and the two Gardaí left us to have a conference with them. Lots of Airport Police emerged from the terminal to glare at us at this point. In the middle of all of this I got a phone call from a concerned Niall Harnett. I told Niall that discussions thus far had been reasonable and that we did not feel either threatened or in Danger. To the credit of the two Gardaí they were both well mannered and at no point did they put a hand on us or our banner. We gave Niall the names and numbers of the two Gardaí and made arrangements in case there were any arrests made. When the conference between the Gardaí and the Airport Police was over the two Gardaí came back to us. They stood talking with us and were blocking the banner from public view. Elaine informed them of this and asked them to move, which they did. The two Gardaí moved to my side between me and the Airport Police who were still glaring at us. The (big) Garda took Elaine’s and Paul’s details after this and then approached me asking me for my date of birth. I informed him that I’d already given him my name and address and that I’d be giving him nothing else. Realising that this particular game was going nowhere he did not pursue it further. We were asked a few times more would we be leaving by the two Gardaí, who were answered in the negative. We displayed the banner for another ten to fifteen minutes before we succumbed to the weather and decided to leave of our own volition. The (big) Garda told me that he had joined the Gardaí for the right reasons as we were leaving. I told him that I accepted this without reservation, but that he should not allow himself to be used for unlawful purposes and asked him to research what constituted an ‘unlawful order.’ He replied that he would and we left to meet our friends outside the airport. Paul picked up the car whilst Elaine and I took the banner and displayed it to everyone we passed as we walked to the checkpoint where our fellow activists were interacting with a large group Gardaí. Our experience begs that many questions be asked. A few weeks ago at a debate in the Oireachtas, which I attended in the company of Ed Horgan and Conor Cregan it was said that the Gardaí were currently engaged in training with regard to them being in a position to enforce Human Rights and specifically so at Shannon airport – this was specifically in regard to policing Extraordinary Rendition flights which frequent Shannon Airport on a frighteningly regular basis. http://www.indymedia.ie/article/85567 How can the Gardaí enforce such lofty goals when they refuse to recognise basic Civil Rights? How can they ensure International Law is adhered to when they don’t even understand simple acts like the Air Navigation and Transport Act and the Public Order Act? Here’s a copy of Section 33 of the Air Transport and Navigation Act. Please note that there is no prohibition whatsoever on photography or a requirement that persons seek the authorisation of Aer Rianta. (iii) whom he knows to have, or reasonably suspects of having, a stolen article in his possession. (2) Where an authorised officer, who is not a member of the Garda Síochána, arrests a person under this section, he shall, forthwith, deliver such person into the custody of a member of the Garda Síochána to be dealt with in accordance with law. (3) Where an authorised officer arrests a person pursuant to the powers conferred on him by subsection (1) (d) (iii), he may retain in his possession any article which he knows to have been, or reasonably suspects of having been, stolen until it has been established whether or not the article was stolen. (4) A person who was ordered by an authorised officer to leave an aerodrome or part of an aerodrome, or who was removed from an aerodrome or part of an aerodrome by an authorised officer, shall not, on the same day, without the permission of an authorised officer, return to the aerodrome or the part of the aerodrome which he was ordered to leave, or from which he was removed, as the case may be. (5) Any person who obstructs or impedes an authorised officer in the exercise of any of the powers conferred on him by this section, or who fails to comply with any lawful requirement of an authorised officer under this section, shall be guilty of an offence. (6) In this section, “authorised officer” has the same meaning as in section 15 of the Act of 1950 (as amended by this Act).